On October 9, 2017, the Hungarian government mailed a national consultation to all eight million eligible Hungarian voters purporting to solicit their opinions about a so-called “Soros Plan.” The statements in the national consultation contain distortions and outright lies that deliberately mislead Hungarians about George Soros’s views on migrants and refugees. Hungarian government officials also falsely claim that George Soros is somehow controlling the European Union decision-making process. In fact, decisions on how to address the migration crisis are made by EU member states and institutions, including the Hungarian government. George Soros started his giving in Hungary in the 1980s, establishing a foundation there in 1984. Since then, his support for Hungarians has totaled roughly €350 million and has included scholarships, health care services, and humanitarian efforts, including €1 million for reconstruction after the red sludge disaster in 2010. He also funds current efforts to help educate children with learning disabilities, tackle homelessness, and bring public transportation to the Hungarian countryside. 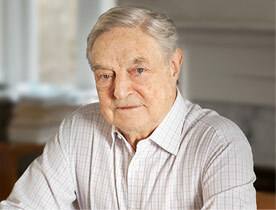 As a concerned citizen, George Soros regularly publishes commentary in newspapers around the world expressing his views and proposing policy approaches on a variety of topics, including the migration crisis. These are all publicly available on his website: www.GeorgeSoros.com. George Soros wants Brussels to resettle at least one million immigrants per year onto European Union territory, including in Hungary. In a 2015 opinion piece, George Soros said that because of the war in Syria, the European Union would have to “accept at least a million asylum-seekers annually for the foreseeable future. And, to do that, it must share the burden fairly” (“Rebuilding the Asylum System,” Project Syndicate, September 26, 2015). A year later, when circumstances had changed, he suggested that the EU should make a “commitment to admit even a mere 300,000 refugees annually” (“Saving Refugees to Save Europe,” Project Syndicate, September 12, 2016). Together with officials in Brussels, George Soros is planning to dismantle border fences in EU member states, including in Hungary, to open the borders for immigrants. George Soros has clearly stated his belief that “the EU must regain control of its borders.” He believes that “the EU must build common mechanisms for protecting borders, determining asylum claims, and relocating refugees.” (“Saving Refugees to Save Europe,” Project Syndicate, September 12, 2016). One part of the Soros Plan is to use Brussels to force the EU-wide distribution of immigrants that have accumulated in Western Europe, with special focus on Eastern European countries. Hungary must also take part in this. In his most recent commentary on the refugee crisis, George Soros endorsed “a voluntary matching mechanism for relocating refugees.” He made clear that “the EU cannot coerce member states to accept refugees they do not want, or refugees to go where they are not wanted.” (“Saving Refugees to Save Europe,” Project Syndicate, September 12, 2016). Based on the Soros Plan, Brussels should force all EU member states, including Hungary, to pay immigrants HUF 9 million (€28,000) in welfare. George Soros did not say that Hungary should be forced to pay HUF 9 million in welfare to immigrants. He did say, “Adequate financing is critical. The EU should provide €15,000 per asylum-seeker for each of the first two years to help cover housing, health care, and education costs—and to make accepting refugees more appealing to member states.” (“Rebuilding the Asylum System,” Project Syndicate, September 26, 2015). This would clearly be a subsidy from the EU to the Hungarian government. Last year George Soros announced that he would contribute to the financial effort by earmarking €430 million of his personal fortune “for investments that specifically address the needs of migrants, refugees and host communities.” (“Why I’m Investing $500 Million in Migrants,” The Wall Street Journal, September 20, 2016). Another goal of George Soros is to make sure that migrants receive milder criminal sentences for the crimes they commit. Nowhere has Soros made any such statement. This is a lie. The goal of the Soros Plan is to push the languages and cultures of Europe into the background so that integration of illegal immigrants happens much more quickly. It is also part of the Soros Plan to initiate political attacks against those countries which oppose immigration, and to severely punish them.